Kalanchoe tomentosa (Crassulaceae) is a perennial, succulent medicinal herb which grown in high terrain and indigenous to low altitude of Indonesia . The leaves of K. tomentosa are used in Indonesian folk medicine for the treatment of fever, infections, rheumatism and skin diseases . The genus of Kalanchoe reported to contain bufadienolides [3-5], triterpenoids  and flavonoids [7-9] which possess multiplebiological activities such as blocking human lymphocyte proliferation [6, 10], cytotoxic agents , insecticidal properties [5, 12] and inhibiting cancer cell growth [13, 14]. However, information about phytochemical constituents of K. tomentosa is unavailable. Our preliminary screening for novel cytotoxic agents from Indonesian Kalanchoe plants, we found that the methanolic extract of K. tomentosa exhibited significant cytotoxic effect against P-388 murine leukimia cells. In this communication, the isolation and structure identification of flavonoids (1-3) along with their cytotoxic activity against P-388 murine leukimia cells will be described. Ultra-Violet spectra were recorded in methanol on Jasco UV-1575 spectrophotometer. The IR spectra were measured on a Perkin Elmer spectrum-100 FT-IR in KBr. Mass spectra were obtained with a Water, Qtof HR-MS XEVotm mass spectrometer. NMR spectra were recorded with a JEOL JNM A-500 spectrometer using tetra methyl silane (TMS) as an internal standard. Chromatographic separation was done on silica gel 60 (Merck). PTLC glass plates were precoated with silica gel GF254 (Merck, 0.25 mm). TLC plates were precoated with silica gel GF254 (Merck, 0.25 mm) and detection was achieved with 10% H2SO4 in ethanol followed by heating. The fresh leaves of K. tomentosa were collected from Lembang Discrict, West Bandung, Indonesia in May, 2011. The plant was identified in Bogoriense Herbarium, Bogor, Indonesia and a voucher specimen (No. B0-129211) was deposited at the herbarium. Fresh grounded leaves (20 Kg) of K. tomentosa were extracted with MeOH at room temperature. The MeOH extract was evaporated under reduced pressure to yield a dark brown residue (360 g). The MeOH extract was dissolved in water and partitioned succesively with n-hexane, EtOAc and n-butanol. Evaporation of each solvents resulted in the crude extract of n-hexane (30.5 g), EtOAc (64.5 g) and n-butanol (43.5 g), respectively. The n-hexane, ethyl acetate and n-butanol extracts exhibited a cytotoxic activity against P-388 murine leukimia cells with IC50 values of 56.5, 24.4 and 45.2 µg/mL, respectively. A portion of the EtOAc extract (50 g) was subjected to vacuum liquid chromatography on silica gel G60 using gradient elution of n-hexane-EtOAc-MeOH to afford 15 fractions (A01-A015). Fraction A05 (3.5 g) was further subjected to column chromatography on silica gel (70-230 mesh) using mixture of n-hexane-EtOAc (10:0-5:1) as eluting solvents to afford 10 fractions (B01-B10). Fraction B04 (230 mg) was subjected to flash column chromatography on silica gel (230-400 mesh), eluted with CHCl3-MeOH (9:1), to give 1 (12.4 mg). Fraction A06-A07 was combined (4.2 g) and subjected to silica gel column chromatography on silica gel (70-230 mesh) using mixture of n-hexane-acetone (10:0-1:1) as eluting solvents to give 10 fractions (C01-C10). Fractions C06 (185 g) were subjected to column chromatography on silica gel (230-400 mesh) using mixture of CHCl3-MeOH (10:0-1:1) as eluting solvents to afford 6 fractions (D01-D6). Fraction D03 (73 mg) was subjected to preparative TLC on silica gel GF254, eluted with CHCl3:MeOH (9.5:0.5) to give 2 (12.5) and 3 (7.8 mg). P-388 cells were seeded into 96-well plates at an initial cell density of approximately 3 x 104 cells cm-3. After 24 hours of incubation for cell attachment and growth, concentrations of samples were added. The samples first were dissolved in DMSO at the required concentration. Subsequent six concentrations were prepared using PBS (phosphoric buffer solution, pH = 7.30 - 7.65). Control wells only DMSO. The assay was stopped after a 48 hours incubation periode by adding MTT reagent 3-(4,5-dimethylthiazol-2-yl)-2,5-diphenyl tetra-zolium bromide and the incubation was continued for another 4 hours, in which the MTT-stop solution containing SDS (sodium dodecyl sulphate) was added and another 24 hours incubation was conducted. Optical density was read by using a micro plate reader at 550 nm. IC50 values were taken from the plotted graph of percentage live cells compared to control (%), receiving only PBS and DMSO, versus the tested concentration of compounds (µg/mL). The IC50 value is the concentration required for 50% growth inhibition. Each assay and analysis was run in triplicate and averaged. Fresh leaves of K. tomentosa were grounded and extracted with methanol at room temperature and concentrated. The methanol extract was suspended in water and successively partitioned with n-hexane, ethyl acetate and n-butanol. The extracts were tested for their cytotoxic activity against P-388 murine leukimia cells and the ethyl acetate extract showed strongest cytotoxic activity. Subsequent phytochemical analysis was therefore focused on the ethyl acetate extract. The ethyl acetate extract was chromatographed over a vacuum liquid cromatography (VLC) column packed with silica gel 60 by gradient elution. The VLC fractions were repeatedly subjected to silica gel column chromatography and preparative TLC on silica gel GF254 to afford three flavonoid compounds 1-3 (Fig. 1). Compund 1 was isolated as a yellowish amorphous. Its UV spectra showed maximum absorption at 272 and 364 nm in MeOH. Its UV spectra showed bathoromic shifts at 280 and 376 nm with NaOH and AlCl3. IR λmax (KBr): 3420, 1690, 1605, 1260, and 720 cm-1. 1H-NMR (CD3OD, 500 MHz): δ 6.28 (1H, d, J=1.95 Hz, H-6), 5.95 (1H, d, J=1.95 Hz, H-8), 7.15 (2H, d, J=6.90 Hz, H-2’, H-6’), 7.01 (2H, d, J=6.80 Hz, H-3’, H-5’). 13C-NMR (CD3OD, 125 MHz): δ 157.7 (C-2), 136.6 (C-3), 176.6 (C-4), 162.3 (C-5), 99.2 (C-6), 164.9 (C-7), 99.1 (C-8), 104.5 (C-4a), 156.9 (C-8a), 123.3 (C-1’), 128.4 (C-2’), 114.5 (C-3’), 159.4 (C-4’), 114.5 (C-5’), 128.4 (C-6’). HR-TOFMS (positive ion mode) m/z 287.0486 [M+H]+, (calcd. for C15H10O6), m/z 286.0477). Structures of isolated compounds 1-3. Compound 1 has a molecular formula of C15H10O6 from its HR-TOFMS spectral data (m/z 287.0486 [M+H]+) and NMR data, thus requiring eleven double bond equivalents. The UV spectrum of 1 showed λmax at 272 and 364 nm and exhibited a bathochromic shift by added NaOH and AlCl3 suggested the presence of flavonoid structure having free 4’- and 5- hydroxyl groups in 1. The IR spectrum of 1 showed the absorption band correspond to hydroxyl (3420 cm-1), conjugated carbonyl (1690 cm-1) and conjugated double bond (1605 cm-1). The 1H-NMR spectrum of 1 showed the presence of two meta-coupled aromatics protons at δ 6.28 and 5.95 corresponds to H-6 and H-8 with coupling constant 1.95 Hz. The 1H-NMR spectrum of 1 also showed the presence of two doublet signals at δ 7.15 (2H, d, J=6.80 Hz, H-2’ and H-6’) and 7.01 (2H, d, J=6.80 Hz, H-3’ and H-5’) corresponds to the four aromatic protons in ring B, characteristics for the 1’,4’-disubstituted flavone. A total fifteen carbon signals were observed in the 13C-NMR spectrum. These were assigned by DEPT and HMQC experiments to fourteen sp2 carbons and a carbonyl signal at δ 176.6. The double bond equivalent was accounted for one out of the total eleven double bond equivalents. The remaining ten double bond equivalents were consistent to flavonol structure . A comparison of the NMR data of 1 with those of kaempferol [14, 15], revealed that the structures of the two compounds are very similar, therefore, compound 1 was identified as kaempferol, which was reported for the first time from K. tomentosa. Compound 2 was isolated as a yellowish solid. UV spectrum λmax (MeOH) nm: 267, 350; IR νmax (KBr) cm-1: 3400, 1730, 1607, 1078. 1H-NMR (CD3OD, 500 MHz): δ 6.18 (1H, d, J=1.90 Hz, H-6), 6.36 (1H, d, J=1.90 Hz, H-8), 7.04 (2H, d, J=6.95 Hz, H-2’, H-6’), 6.85 (2H, d, J=6.95 Hz, H-3’, H-5’), 5.20 (1H, d, J=7.5 Hz, H-1’’), 3.79 (1H, m, H-2’’), 3.42 (1H, m, H-3’’), 3.42 (1H, m, H-4’’), 3.72 (1H, m, H-5’’), 3.52 (1H, dd, J=12.0, 4.5 Hz, Ha-6’’), 3.68 (1H, dd, J=12.0, 2.0 Hz, Hb-6’’). 13C-NMR (CD3OD, 125 MHz): δ 154.6 (C-2), 135.6 (C-3), 179.4 (C-4), 106.6 (C-4a), 162.6 (C-5), 100.2 (C-6), 165.8 (C-7), 98.4 (C-8), 159.6 (C-8a), 122.6 (C-1’), 128.4 (C-2’), 116.3 (C-3’), 160.8 (C-4’), 116.3 (C-5’), 128.4 (C-6’), 97.1 (C-1’’), 79.7 (C-2’’), 78.1 (C-3’’), 74.3 (C-4’’), 78.4 (C-5’’), 66.6 (C-6’’). HR-TOFMS (positive ion mode) m/z 449.3567 [M+H]+, (calcd. for C21H20O11), m/z 448.3769). Compound 2 has a molecular formula of C21H20O11 from its HR-TOFMS spectral data (m/z 449.3567 [M+H]+) and NMR data, indicating the presence of twelve double bond equivalents. UV spectrum of 1 displayed λmax at 267 and 350 nm indicated the presence of a flavonoid skeleton . IR spectrum of 1 indicated the presence of hydroxyl (3400 cm-1), carbonyl (1710 cm-1), conjugated double bond (1607 cm-1) and ether groups (1078 cm-1). 1H-NMR spectrum of 2 displayed that protons in B ring gave a doublet (2H, d, J=6.95 Hz) at δ 7.04 and 6.85, suggested the presence p-disubstituted benzene ring. Protons in ring A were observed at δ 6.18 (1H, d, J=1.90 Hz) and 6.36 (1H, d, J=1.90 Hz), respectively, suggested the presence of meta-aromatic proton at H-8 and H-6. Based on these observation and comparison of NMR data previously reported , indicated that 2 had a kaempferol as a glycone. The 1H-NMR spectra of 2 also showed the presence of an anomeric proton as a doublet at δ 5.20 suggesting a sugar residue was identified as β-glucopyranose on the basis of coupling constant (J1’’,2’’=7.5 Hz) [15, 16]. The 13C-NMR spectrum showed 21 carbon signals, which were classified by their chemical shifts and the DEPT spectra as one oxygenated sp3 methylene, four oxygenated sp3 methines, one anomeric carbon, six sp2 methines, eight sp2 quartenary carbon and one carbonyl. The double bond equivalen was accounted for eight out of the total twelve double bond equivalents. The remaining four double bond equivalens were consistent with the flavone skeleton with a β-glucose residue . Based on the above evidences and biogenetic point of view occurance the flavonoid structure in Kalanchoe genus, suggested that compound 2 having flavonoid structure [14-16] consists of kaempferol as an aglycone moiety and β-D-glucoside as a sugar residue. The position of the β-D-glucosyl moiety in 2 was identified at C-3 position on the basis of COSY and HMBC correlations as shown in Fig. (2). Consequently, structure 2 was identified as kaempferol-3-O-β-D-glucoside or known as astragalin consistent to the reported literature values [16, 17], which was reported for the first time from K. tomentosa. Compound 3 was isolated as a yellow solid. Its UV spectra showed maximum absorption at 276 and 370 nm in MeOH. IR νmax (KBr): 3360, 1670, 1607, 1508, 1452, 1024 and 820 cm-1. 1H-NMR (CD3OD, 500 MHz): δ 12.55 (1H, s, 5-OH), 7.20 (2H, d, J=7.20 Hz, H-2’, H-6’), 6.90 (2H, d, J=7.20 Hz, H-3’, H-5’), 6.10 (1H, d, J=2.0 Hz, H-8), 5.95 (1H, d, J=2.0 Hz, H-6), 5.49 (1H, d, J=1.9 Hz, H-1’’), 3.80 (1H, dd, J=8.0, 7.1 Hz, H-2’’), 3.45 (1H, dd, J=10.0, 4.30 Hz, H-3’’), 3.42 (1H, t, J=10.0 Hz, H-4’’), 3.74 (1H, dd, J= 10.0, 6.1 Hz, H-5’’), 0.94 (3H, d, J= 6.0 Hz, H-6’’); 13C-NMR (CD3OD, 125 MHz): δ 153.6 (C-2), 134.6 (C-3), 179.7 (C-4), 104.5 (C-4a), 163.3 (C-5), 98.6 (C-6), 165.5 (C-7), 99.4 (C-8), 155.0 (C-8a), 124.0 (C-1’), 128.4 (C-2’), 114.6 (C-3’), 158.0 (C-4’), 114.6 (C-3’), 128.4 (C-2’), 97.0 (C-1’’), 74.8 (C-2’’), 77.5 (C-3’’), 78.6 (C-4’’), 75.6 (C-5’’), 20.8 (C-6’’). HR-TOFMS (positive ion mode) m/z 433.1104 [M+H]+, (calcd. for C21H20O10), m/z 432.1056). Selected COSY and HMBC Correlations of 2. Compound 3 has a molecular formula of C21H20O10 from its HR-TOFMS spectral data (m/z 433.1102 [M+H]+) and NMR data, thus requiring twelve degrees of unsaturation. The UV spectrum of 3 showed λmax at 276 and 370 nm indicated a flavonoid structure [14,15]. The IR spectrum of 3 showed the presence of hydroxyl (3360 cm-1), conjugated carbonyl (1670 cm-1), conjugated double bond (1607 cm-1) and ether group (1024 cm-1). 1H- and 13C NMR signals of 3 were similar to those of 2, the main differences are the presence of a secondary methyl group at as a doublet at δ 0.94 (3H, d, J=5.7 Hz) and absence of oxymethylene group at C-5 position of the sugar unit, suggested that compound 3 is consist a flavonoid skeleton of kaempferol as an aglycone moiety and rhamnoside as a sugar unit. The anomeric proton had a coupling constant of 1.9 Hz, conforming the α-orientation of L-rhamnosyl moiety. Based on the above spectral data, structure 3 was identified as kaempferol-3-O-α-L-rhamnoside consistent with previously reported [14,18], which was reported for the first time from K. tomentosa. The cytotoxic effects of the three isolated compounds 1-3 against the P-388 murine leukimia cells were conducted according to the method described in previous paper [19, 20] and were used an artonin E (IC50 0.3 μg/mL) as a positive control . Compounds 1-3 showed cytotoxicity against P-388 murine leukimia cells with IC50 values of 51.8, > 100 and 3.32 ìg/mL, respectively, suggested that the presence of rhamnoside sugar unit in flavonoid structure can increase cytotoxic activity whereas the presence of glucoside unit can decrease cytotoxic activity. The ethyl acetate extract of K. tomentosa fresh leaves showed the presence of flavonoid structure, kaempferol (1), kaempferol-3-O-β-D-glucoside or astragalin (2) and kaempferol-3-O-α-L-rhamnoside or afzelin (3). The presence of rhamnoside sugar unit in flavonoid structure can increase the cytotoxic activity against P-388 murine leukimia cells. This investigation was financially supported by Directorate General of Higher Education, Ministry of Education and Culture, Indonesia (PUPT Scheme, 2013-2014, by EJ). We thank Mr. Achmad Darmawan and Mrs. Sofa Fajriah in the Research Center for Chemistry, Indonesian Science Institute, for NMR measurements. We are grateful to Mr. Uji Pratomo at Center Laboratory of Padjadjaran University for HR-TOFMS measurements. Heyne K. The Useful Indonesian Plants, Research and Development Agency. Jakarta, Indonesia: Ministry of Forestry 1987; pp. 845-6. Hutapea JR. Inventory of Indonesian Medicinal Plants. Jakarta, Indonesia: Research and Development Agency, Ministry of Health 1994; pp. 117-8. Capon RJ, MacLeod JK, Oelrichs PB. Bryotoxin B and C, toxic bufadienolide orthoacetates from the flowers of Bryophyllum tubiflorum (Crassulaceae) Aust J Chem 1986; 39: 1711-5. Yamagishi T, Haruna M, Yan XZ, Chang JJ, Lee KH. Antitumor agents, 110. Bryophyllin B, a novel potent cytotoxic bufadienolide from Bryophyllum pinnatum J Nat Prod 1989; 52(5): 1071-9. 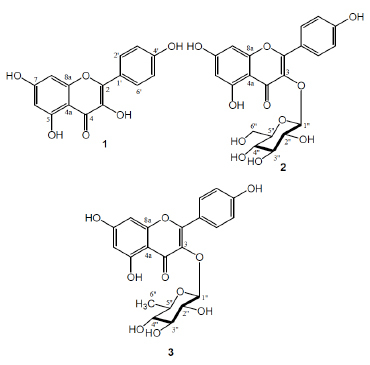 Supratman U, Fujita T, Akiyama K, Hayashi H. New insecticidal bufadienolide, bryophyllin C, from Kalanchoe pinnata Biosci Biotechnol Biochem 2000; 64(6): 1310-2. Gaind K. `N., Singla, A.`K., Boar, R.B., Copsey, D.B. Triterpenoids and sterols of Kalanchoe spathulata Phytochemistry 1976; 15: 1999-2000. Costa SS, Jossang A, Boda RB. 4””-Acetylsagittatin A, a Kaempferol Triglycoside from Kalanchoe streptantha J Nat Prod 1996; 59: 327-9. Liu KC, Yang SL, Robert MF, Phlipson JD. Flavonol glycosides with acetyl substitution from Kalanchoe gracilis Phytochemistry 1989; 28: 2813-8. Liu KC, Yang SL, Robert MF, Phlipson JD. Eupafolin rhamnosides from Kalanchoe gracilis J Nat Prod 1989; 52: 970-4. Almeida AP, Da Silva SA, Souza ML, et al. Isolation and chemical analysis of a fatty acid fraction of Kalanchoe pinnata with a potent lymphocyte suppressive activity Planta Med 2000; 66(2): 134-7. Wu PL, Hsu YL, Wu TS, Bastow KF, Lee KH. Kalanchosides A-C, new cytotoxic bufadienolides from the aerial parts of Kalanchoe gracilis Org Lett 2006; 8(23): 5207-10. Supratman U, Fujita T, Akiyama K, Hayashi H. Insecticidal compounds from Kalanchoe daigremontiana x tubiflora Phytochemistry 2001; 58(2): 311-4. Supratman U, Fujita T, Akiyama K, et al. Anti-tumor promoting activity of bufadienolides from Kalanchoe pinnata and K. daigremontiana x tubiflora Biosci Biotechnol Biochem 2001; 65(4): 947-9. Toker G, Memisoglu M, Yesilada E, Aslan M. Main flavonoids of Tilia argentea DESF ex DC leaves Turk J Chem 2004; 28: 745-9. Nakano K, Takatani M, Tomimatsu T. Four kaemferol glycosides from leaves of Cinnamomum sieboldii Phytochemistry 1983; 22(12): 2831-3. Furusawa M, Tanaka T, Ito T, et al. Flavonol glycosides in leaves of two Diospyros species Chem Pharm Bull (Tokyo) 2005; 53(5): 591-3. Kuruuzum-uz A, Guvenalp Z, Kazaz C, Demirer LO. Phenolic compounds from the roots of Anchusa azurea var azurea Turk J Pharm Sci 2013; 10(2): 177-84. Chaturvedula VS, Prakash I. Kaempferol glycosides from Siraitia grosvenorii J Chem Pharm Res 2011; 3(6): 799-804. Sahidin , Hakim EH, Juliawaty LD, et al. Cytotoxic properties of oligostilbenoids from the tree bark of Hopea dryobalanoides Z Naturforsch C 2005; 60(9-10): 723-7. Harneti D, Tjokronegoro R, Safari A, et al. 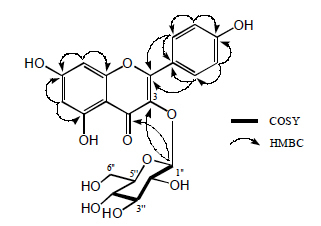 Cytotoxic triterpenoids from the bark of Aglaia smithii Phytochem Lett 2012; 5: 496-9. Hakim EH, Achmad SA, Juliawaty LD, et al. Prenylated flavonoids and related compounds of the Indonesian Artocarpus (Moraceae) J Nat Med 2007; 61(2): 229-36.